CSS3 generators, which are tools you can use to create, interact with, or test code. These tools include a wide range of specific types, including wizards, designers, Integrated Development Environments (IDEs), and a host of other items. Even with this tool, you don’t get complete selector support. Fortunately, the Selectivizr site provides a list of selectors and tells you which selector types it supports for a given library. With this knowledge, you can usually overcome any selector issues when working with older browsers. Developers use lists for a number of tasks when creating a page. For example, lists play an important part in creating many menus. Another purpose for lists is to display content. You can display all of the content at once, or make the content special by presenting one item at a time. 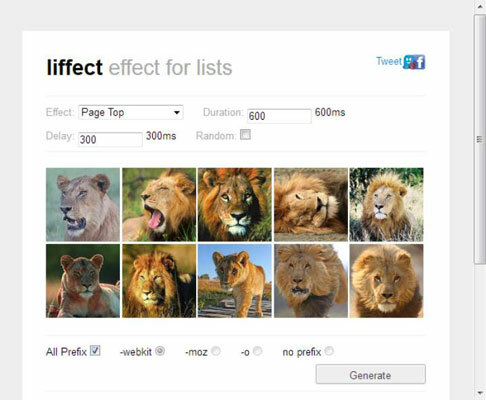 The purpose of Liffect is to make it possible to create special effects for lists. This tool generates custom code for animating your content list. All you do is define the kind of animation you want, the time the animation requires to complete, the delay between items, and whether you want items selected randomly. At the bottom of the page are selections for the kind of browsers you want to support. Yes, you can create any browser-based application you want by using a simple text editor. Any editor that outputs text without any formatting will work just fine. In fact, any method you have of producing pure text output will work. In some cases, you want to create a custom font stack so that your page appears precisely as you want it to appear to the end user. Another solution to this problem is to use FFFFALLBACK — a tool that makes it possible to try various font combinations on the target page. The page contains instructions for using this tool. You simply drag the bookmarklet to the toolbar of your browser, where it becomes a clickable button. Go to the site you want to modify, and then click the FFFFALLBACK button. The tool analyzes the CSS on the page and creates a clone of the page. You’ll also see a tool on the cloned page that you can use to test various fonts. To change the font, type the font name and press Enter in the field supplied. The fallback font you choose appears in an alternative color, below and to the right of the original font. 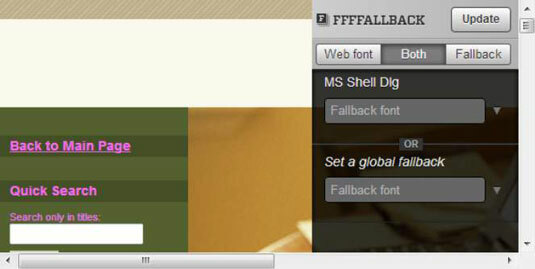 To see just the fallback font, click Fallback. Likewise, to see just the original font, click web Font. This particular tool only works with webkit browsers such as Firefox, Chrome, and Safari. It doesn’t work with other browsers, including Internet Explorer and Opera.